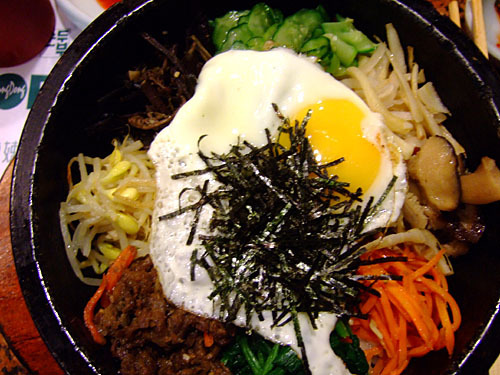 Ever since having an amazing bibimbap in Japan, I've been searching for a comparable version here in the States. So far, nothing had really met the mark, so when I was told about Young Dong's version, I was naturally a bit skeptical. Note: My knowledge of Korean cuisine is actually quite limited, so please feel free to correct me if I've made any factual mistakes! 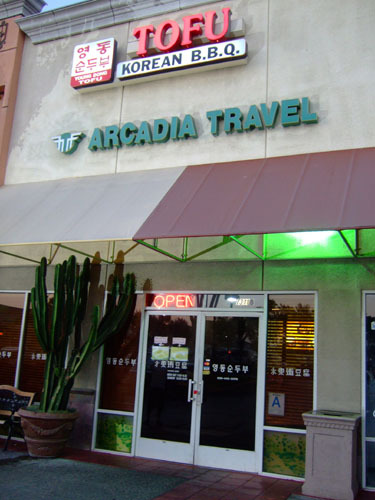 Young Dong shares its space with Arcadia travel, which is located in the back of the unit. 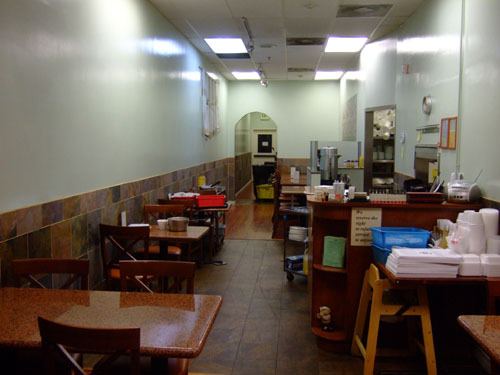 Located in a strip mall, the exterior of the restaurant is about what I expected, that is, quite nondescript. The theme continues into the interior, which is clean and relatively comfortable. Again, no surprises here. The menu is fairly compact, with a smattering of items and a few combinations, meaning that the dishes come with a bowl of your choice of jjigae. Note the odd pricing (i.e. $9.24, $11.55) of the menu items; I suspect that's to simply after-tax calculations ($9.24 to $10.00, $11.55 to $12.50, assuming an 8.25% tax rate). Click for larger versions. The first item we were served, even before the banchan came out. Not bad, but really not much to say here. I initially had this posted as pajeon, but I was told by a reader (see comments below) that this was actually "bin dae dduk," a sort of mung bean pancake. 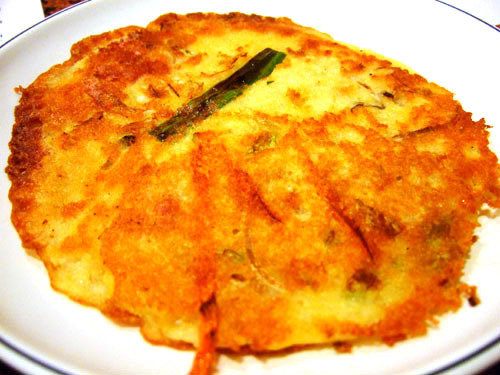 In fact, another name for it is "nokdujeon," or literally "mung bean pancake." 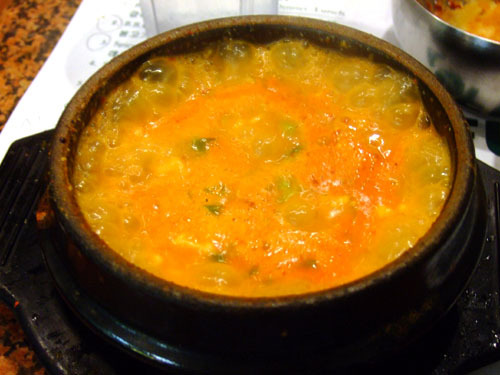 Bindaetteok are made of ground mung beans and various ingredients, green onion in this case (others include kimchi, pork, and bean sprouts), cooked in a frying pan. 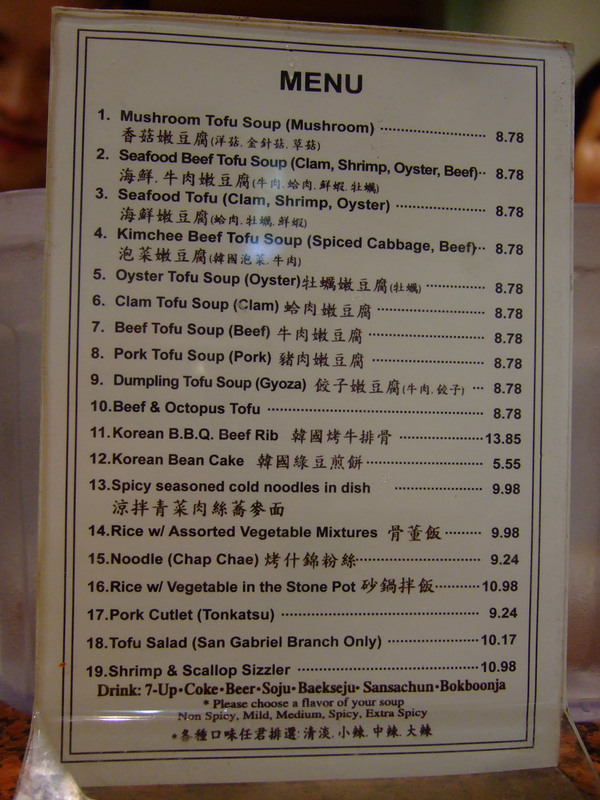 Many tofu places serve this dish due to the mung bean's cooling property (yin food). This was basically cucumber in a hot chili sauce. In any case, this was one of my favorite banchan, with the crunchy coolness of the cucumber tempering the chili's spicy bite. 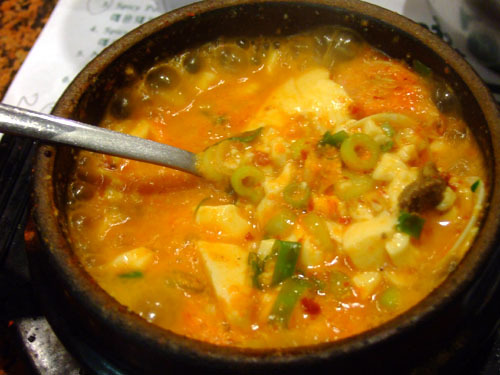 I originally had this listed as kongnamul but was later corrected, as with the bindaetteok. This was sukjunamul, which consists of boiled mung bean sprouts seasoned with sesame oil, sesame seeds, green onions, and pepper. Surprisingly good, with a nice crunch. I believe this was baechu kimchi, or kimchi made with Napa cabbage. 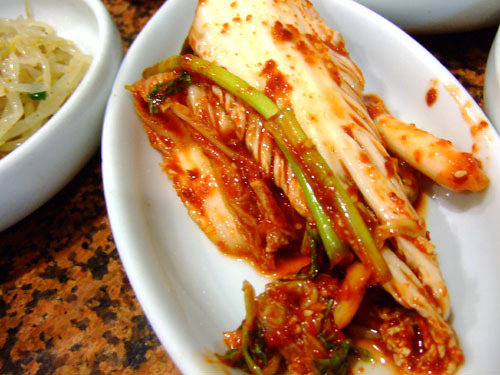 Kimchi, of course, can be made with a variety of vegetables, and of those, Napa cabbage is the most popular. I've always had somewhat of a fondness for kimchi, and this did not disappoint. Miyeok, a type of edible kelp, with sweet vinegar and salt. 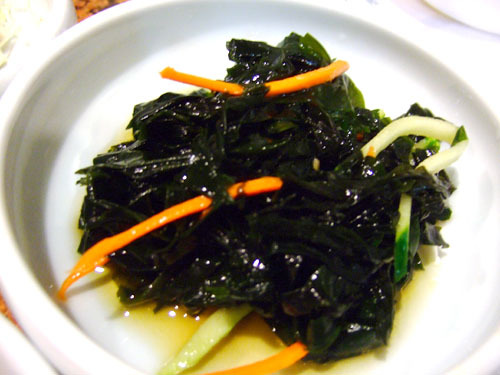 The seaweed is known as wakame in Japanese cuisine, where it is often used in miso soup. Pickled squid and cucumber, on top of white cabbage. This was my favorite of the banchan, with a great textural contrast between the squid and cucumber, and a fantastic interplay between their spiciness and the mildness of the cabbage. 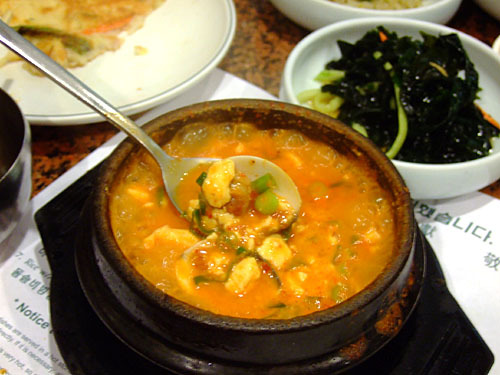 Sundubu jjigae is a hot and spicy jjigae (stew) made with uncurdled dubu (tofu) and a variety of items that can include seafood, vegetables, mushrooms, onion, and gochujang (chili pepper paste). Shown above is a version with clam. 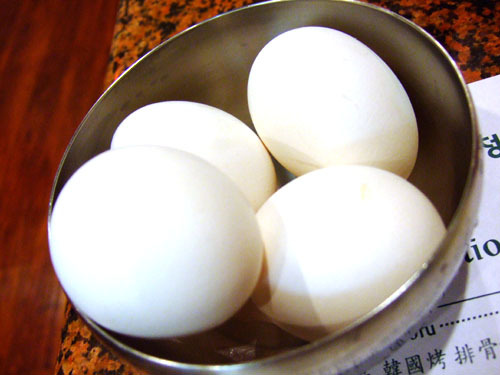 Raw eggs (left) are put into jjigae while still boiling in its stone bowl. 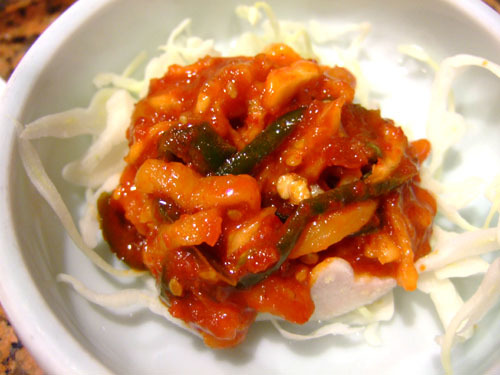 The dish is usually eaten with white rice (which aids in tempering the heat) and banchan. 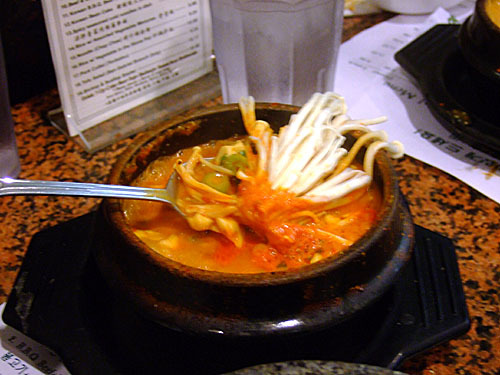 We also tried jjigae with mushroom (pengi beoseot I believe, otherwise known as enokitake in Japanese) and kimchi. 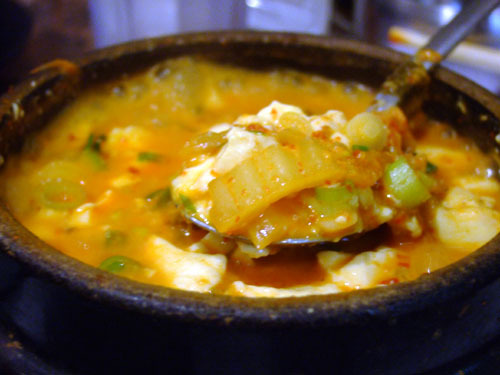 Now this was the sundubu jjigae I ordered. This was my first time having it and I thought all four versions we tried were all delicious, and quite spicy. Next time I may ask them to turn down the heat a bit! Perhaps the most famous of all Korean dishes (well, behind kimchi of course), bulgogi is made from thin slices of meat (usually beef), which is marinated in a mixture of soy sauce, sugar, onions, and other ingredients. 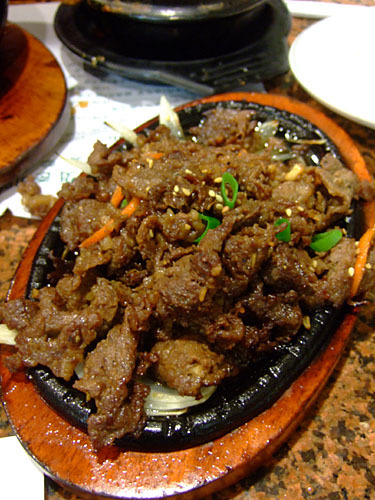 Bulgogi literally means "fire meat" in Korean and the term can also be applied to variations such as dweji bulgogi (pork), dak bulgogi (chicken), or even ojingeo bulgogi (squid), although the seasonings employed are usually different. Here, I found both types very tender and nicely flavored, though I did prefer the spicier kick of the pork version. Ah finally, the moment of truth. 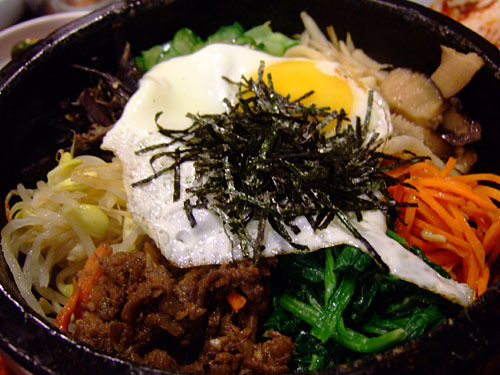 Bibimbap, which means "mixed rice," consists of a bowl of warm white rice topped with various ingredients, which are stirred together thoroughly prior to eating. The items include here were gim (a nori-like seaweed), fried egg, spinach, beef, kongnamul (soybean sprouts), gosari (bracken fern stems), cucumber, doraji (bellflower root), mushroom, carrot, gochujang (chili pepper paste), and sesame oil. This particular version was also of the dolsot variety, which meant the entire dish was served in a sizzling stone bowl. Before the rice is placed in the bowl, the bottom of the bowl is coated with sesame oil, making the layer of the rice touching the bowl golden brown, crispy, and delicious. So how did it turn out? Superb. 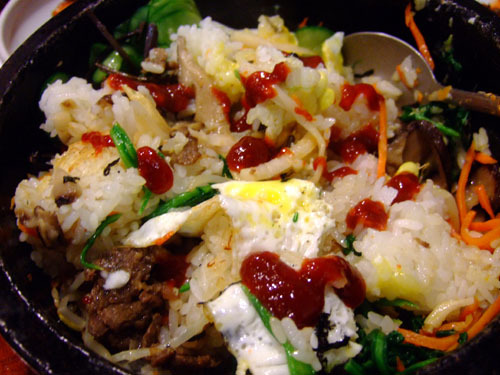 With bibimbap, I often find that the rice is too monolithic, and tends to distract from the dish, keeping the various components from harmonizing together. That was not the case here; everything just flowed together so nicely, creating a fantastic balance of flavors and textures. It finally looks like I've found a bibimbap comparable to that which I experienced in Japan. If only this place wasn't so far away! hey! there is a place for bibimbap on Olympic (2716 W Olympic Blvd # 101) called Jeon Ju. 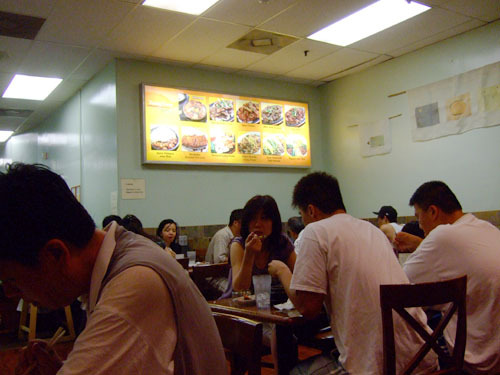 it's a hole in the wall, but it's good =) give it a try if you are ever in k-town! Thanks Grace! Will keep it in mind next time I'm in the mood. 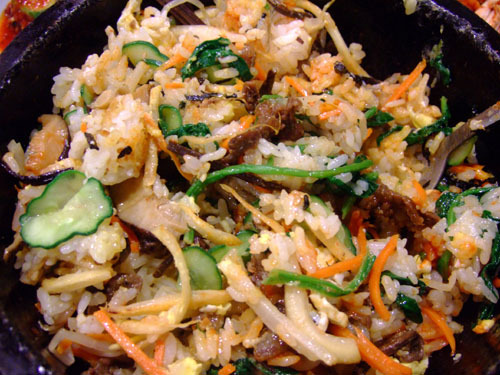 The bibimbap sounds so good! How was the soon tofu btw? The bibimap was very good. The sundubu was as well, though I'll admit I don't have that much experience with it! From the texture of the Jeon in the picture, I think it was 'Bin Dae Dduk', not Pajeon. 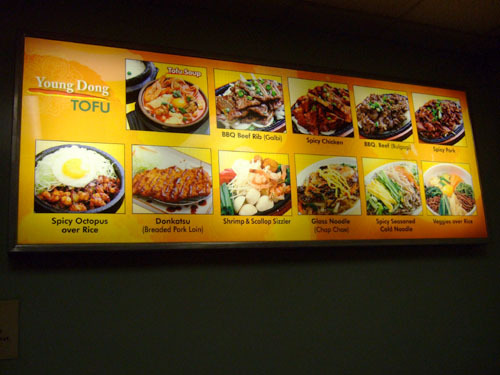 Almost all tofu places I've been to, they serve 'Bin Dae Dduk' because of mungbean's cooling property(Yin food). 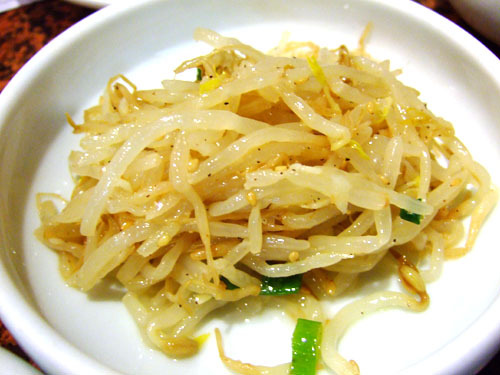 In 'BinDaeDduk', mung bean is ground and mixed with bean sprout, ground pork, kimchi, etc. Don't feel bad. Most of jeons look the same anyway. BTW, I enjoy your blog very much. -from an Korean wanna-be foodie. Sorry, one more banchan to correct.. It's SOOK JU NA MUL made in same exact way as Kongnamul. 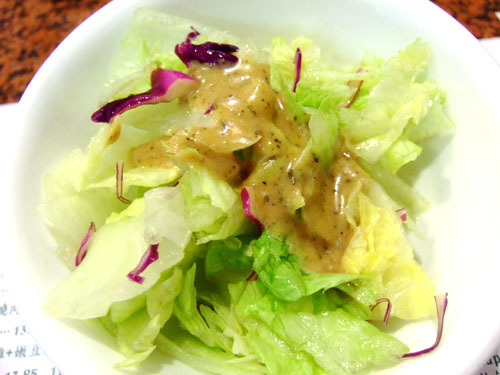 Sookju is from mungbean, again, Yin food. 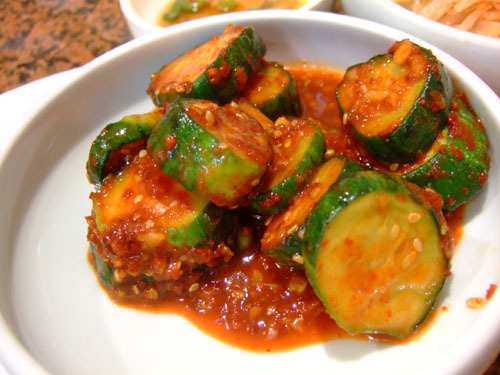 The cucumber banchan is oi kimchee. 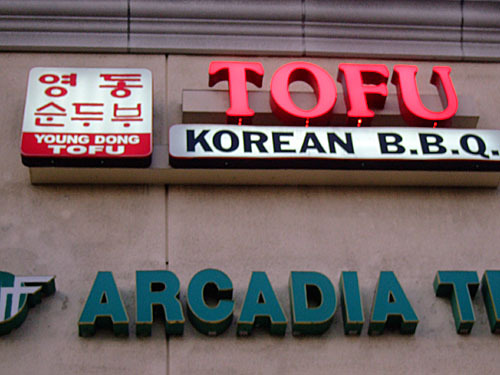 BTW, Garden Grove has a sizeable Korean business district, you don't have to trek that far to get good eats. 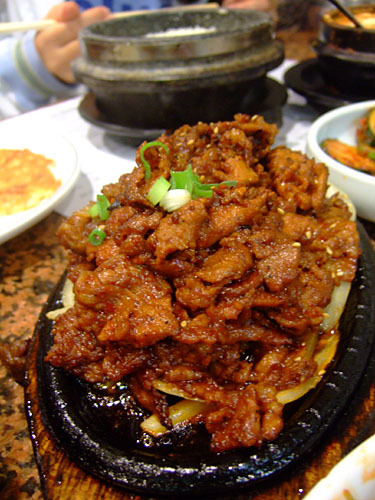 My favorite is Seol Ak San in Stanton where the meat is grilled on a rock slab. And Light Town House on GG Blvd. is good for overall eats. nice review. They actually do have some of the best soontubu in LA. 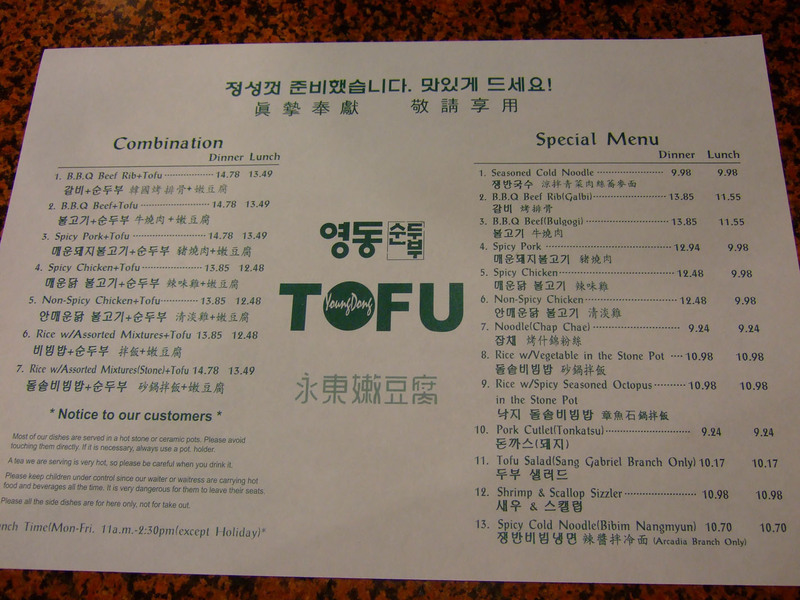 If you want something almost as good, Tofu Village in Koreatown is a good choice. Matt, it's good to know that one of my first experiences with soontubu was at one of the best. Tofu Village is another name that I've heard pop up as well.